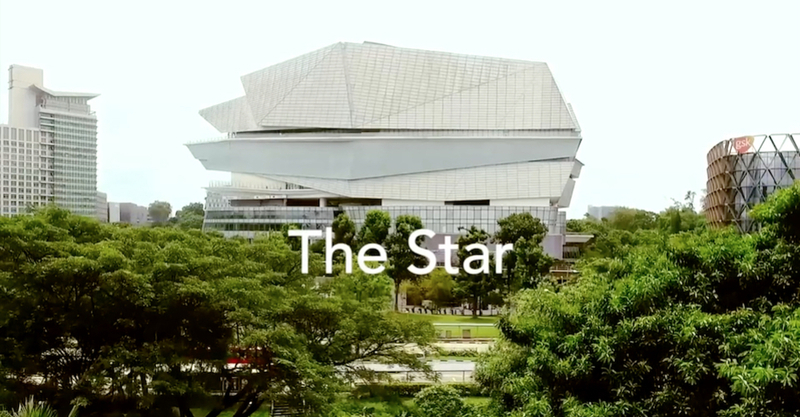 Located at Buona Vista, Singapore, The Star is a mixed use development designed by Andrew Bromberg at Aedas: bringing together a rentable floor space and a state of the art performance venue for an audience of 5,000 people, The Star is a monumental and quite surprising building. A film by Alice Masters and Joe Almond leads us inside of its majestic spaces, to explore its social and cultural value as civic space. A skateboarder will be our guide: moving through restaurants, shops, an outdoor amphitheatre and a 5000 seat auditorium, he will encounter boys and girls hanging out on the stairs of its public squares, customers doing their shopping, workers and people fighting the hot wet humid Singapore climate in the Grand Foyer, which is provided with a passive sustainable environmental temperature control system. There's a bit of a thriller vibe in the movie, as a security guard is closely following the skateboarder through the structure: while the guys does his tricks with the skate, we cannot help but wonder if he's allowed to do that. This little doubt - which may be or may be not right, as he's only skating outside The Star - helps to set the film in motion and create an atmosphere that makes it enjoyable. Having studied industrial design, Joe Almond moved from there into filmmaking, working on narrative content. He used his expertise in design an shifted towards architecture films, working with director Alice Masters. Of course, the most notable feature of The Star is, quite obviously, the vast auditorium, which, with its 40 meters of height and its 5000 seats, is by far the largest such auditorium in Singapore. The auditorium is incorporated in the structure of The Star to create an area filled with eateries and shops to serve all the theatre-goers. The mall welcomes new services and finally becomes a space for interactions, a new arena for Singapore.